Is it just ‘Summer’ Doldrums? Since the release of the June metrics, there’s been a general consensus that a peak has been reached. The only conjecture is when growth is likely to increase again. Or if it will at all. The northern hemisphere commentators are calling it summer doldrums but not ruling out a deeper change. Australian users are contradicting the trend, with a jump from 1.93% to 2.61% in active Australian users. That’s arguably because the Australiam media’s interest in Second Life is recent when compared to the USA and Europe. As media stories increase their focus on user growth, some will argue the media are spooking potential new users. That may be a risk, however any product lives or dies on its usability and Second Life is no different. Imminent enhancements like voice will determine in a large way that perception of improving usability. Meta Linden has once again given an update on SL metrics. Linden state there’s now 12,910 active aussie users, meaning that Australia has moved from 11th to 10th place in the world with 2.61% of the active SL population. As we stated last month, the definition of active is fairly generous but growth does indeed continue. The rate of growth has slowed in recent months however it’ll be interesting to see the impact of the 60 Minutes / Australian Women’s Weekly coverage on registrations. 2. For large presences we’ve chosen the most popular area rather than add up total dwell – this means larger presences may have overall larger numbers but that’s not what we’re measuring (see also point 5). Telstra’s Billabong Bar and the ABC Island Sandbox are no surprises as popular haunts. Armory Island by its very nature has a wide international popularity hence its number one position. The Australia Sim is garnering a lot of traffic for a new build and Lord Coalcliff’s Skyhome Resort is a stayer. Another relatively new presence is Sofia’s furniture and its popularity isn’t to be sneezed at either. 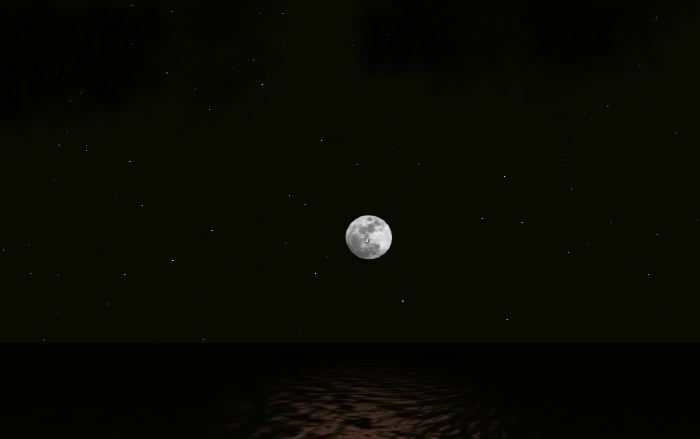 If you have a presence in SL that you’d like added to the index, let us know. It just has to be owned / operated by Australians for inclusion. We look forward to any feedback and watch out next month for a more comprehensive index. Meta Linden has again given an update on SL metrics. This month there’s been a number of changes including the addition of a “Countries By Active” category which takes a little more of the guesswork out of estimating the Australian SL community. Because the measures have changed since last monthit’s difficult to provide a trend. Australia has maintained it’s ranking at 11th in the world but the percentage of the overall population has ‘dropped’ to 1.93% under the new measure. This translates to 9779 active users – active is defined as being logged in for more than one hour during the reporting period. This is a fairly generous definition of active – the numbers of users logged in more than once per week would obviously be much lower again. 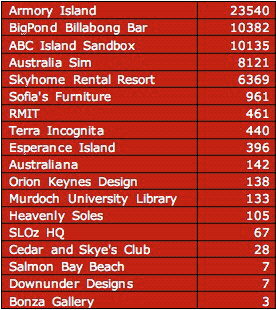 Major credit to Linden Lab for their transparency on the figures and it certainly quashes some of the wild claims we’ve heard over the past couple of months about there being closer to 20 thousand active aussies in SL. Last month we claimed an active Australian population coming up on ten thousand and that’s been born out by the Linden figures. The rapid growth has continued to slow and we don’t believe there’ll be any significant change in the coming month, just slow but steady growth. 3. 2.43% of THAT is 9759. As we stated last month, we expected the growth to continue, albeit at a much slower rate after the large jump in March. Our prediction for next month is continued growth but at an even slower rate.